We had originally planned to complete all seizures by end October 2014 and fly the big cats to a sanctuary in the US, but animals were still being collected in November. This, and the winter weather in the north meant the flight must be postponed until the temperature differential was less severe – we were concerned about the temperature shock. The decision was made to move the flight to April 2015. However, there would be more twists! The delay was expensive for ADI, running two rescue centers in Peru and Colombia stretched our finances and our people – but we knew this was the right thing to do. Emptying whole countries of suffering circus animals is a huge victory for all animals, now and in the future. Little did we know that for many animals, the delay would be a lifesaver. In March, we received a tip off that the circus with the three female lions, which had eluded us six months earlier at Huaral, had reappeared in the far north of Peru. An ADI investigator was sent to get the proof. He provided the authorities with photographic evidence of the lionesses and never let the circus out of his sight. On 12 March 2015, in Sullana, Piura, we moved in with wildlife officials, seizing the three lionesses and two monkeys. This was also our first meeting with Cholita, the spectacled bear. CITES officials had told us 25 year old Cholita’s story and said they had not been able to find a home for her in Peru due to her appearance. They asked if we could make space for Cholita on the Spirit of Freedom flight and we agreed, provided they could issue the permits (which they and the USFWS did amazingly fast). The Piura ATFFS officers introduced us to Cholita and we were smitten. 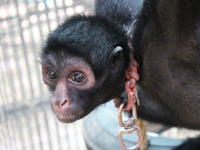 Stolen from the wild as a baby (her mother was likely killed and possibly eaten), Cholita had been illegally sold to a circus and her fingers had been cut off down to stumps to remove her claws; her canine teeth had been snapped off. Wildlife officials had seized her from the circus and placed her in temporary custody in the zoo, where she had remained for a decade. She had also lost almost all of her fur due to stress and suffered constant diarrhea. Of course we would not leave Cholita behind! Provided she was fit to fly, the Spirit of Freedom Flight, at that time destined for the US, would include Cholita. ADI committed to give her a new life whatever happened. In early April removed Cholita and a woolly monkey called Nena from the zoo. First steps to freedom. Meanwhile, publicity following the raid in Piura led to more tip-offs – the circus with a tiger and another with a condor had been seen by a member of the public! 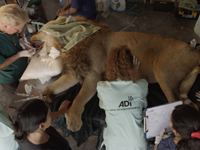 ADI was not going to leave anyone behind – we had one flight, once chance for freedom for these animals and they were going to be taken from the circuses. We knew our team and resources were stretched to the limit. 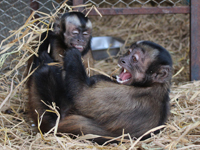 Logistically, it was impossible to get these animals from a very remote area (two days’ drive), move our 40 monkeys to the new habitats we built in the Amazon and still have the Spirit of Freedom flight depart Sunday April 19 as planned. It was a simple choice, delay the flight again or leave animals behind. The flight was delayed. In late April, ADI and the Piura ATFFS raided the circus– which had slipped through the net six months earlier – and rescued Hoover the tiger. Sadly their other tiger, Darta, had since died. They claimed to have owned 12 tigers, 11 were dead. The next day, we raided the circus with the condor, Condorito, and Musafa the mountain lion, who had lived for 20 years, chained in a pick up truck, amongst metal circus props and equipment. We had now tracked down and emptied every circus we had recorded in our 2014 census. Including the Colombian lions we had saved 33 lions, a tiger, a bear, a mountain lion, and (at the time of going to press) over 50 native wild animals, mainly monkeys.